The new 2987 Series knife offered on the Yetter 2987 Magnum fertilizer knife is now made of cast material and carries a tungsten carbide edge for wear resistance through many acres of use. The knife wraps around the fertilizer tube for better wear protection from the soil and adds significantly to productive knife life. The Magnum knife components can be replaced one at a time to reduce the cost of replacing the entire unit, and the new model is spring loaded to allow the knife to be self-adjusting. Yetter's new "wrap around" knife is cast construction and fefatures a tungsten carbide edge for long hours in the field at productive speeds. Also, the single-disc design of the 2987 Magnum has a lower draft requirement than many conventional fertilizer application tools and reduces fuel costs. 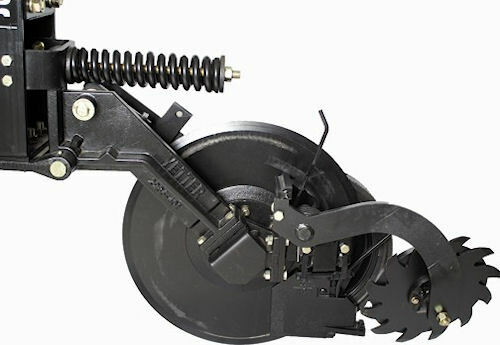 Other key features of the unit include a spring-loaded closer wheel and wiper wheel. The Magnum 2987 is designed to run at 8- to 10 miles per hour. For more information, click on www.yetterco.com, or call (800) 447-5777.